The Level 5 Diploma in Computing is a 120 credit size qualification and is the equivalent level to the 2nd year of a degree. Learners must complete all the mandatory units totalling 120 credits. 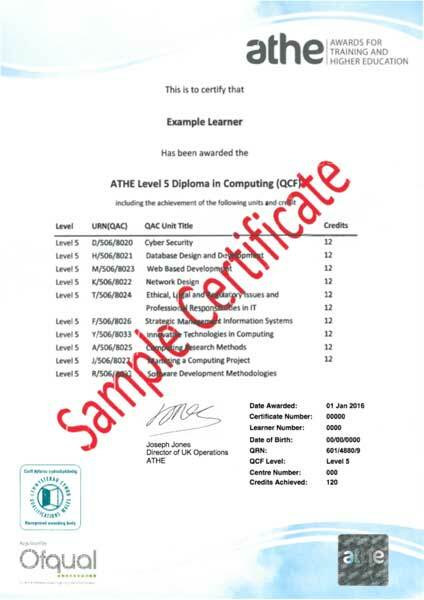 This computing qualification cover a broad range of computing specialisms and were developed to provide a foundation of skills and knowledge for those working in a variety of roles such as Programming, Information Systems Management, Web Development, Software Engineering and more. The Level 5 Diploma in Computing includes core areas such as programming, but also higher level subjects such as Strategic Management Information Systems, Computing Research Methods, and Managing a Computing Project.